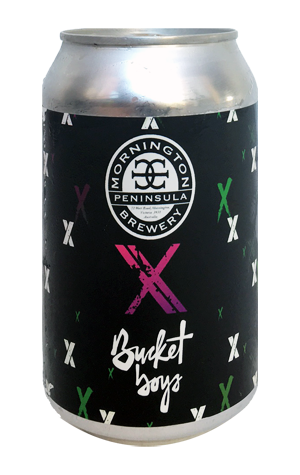 Both Mornington Peninsula Brewery and Bucket Boys are breweries that like to put out hop forward beers so it makes sense that, when they decided to collaborate on a beer at the former's home in Victoria, they would brew a beer with hops at its heart. That beer is X, an XPA originally poured at the Australian Hotel Beer Festival in The Rocks and set to appear at events through Sydney Beer Week, as well as in cans elsewhere. It's not among the most extravagant beers either has put their name to in terms of overt hoppiness; indeed, the fruity aromas arising from this pale and hazy little number are relatively subdued – dig in, though, and you'll pick up white grapes, lemon and gooseberries in there. The hops are more apparent to taste, contributing tropical flavours and a mildly resinous bitterness in what's a lean, tightly wound affair.